Today, business owners, here's a test of your knowledge of Social Security, Social Security cards, and Social Security numbers. These are questions about Social Security that every business owner should know the answers to. It's true/false and the answers follow the questions, so you don't have to work too hard. FALSE. A Social Security number is just one form of tax ID number. Other tax ID numbers are Employer ID numbers and other special numbers given to non-drivers and others. TRUE. Since a sole proprietor (owner) is not a separate entity from the business, the business identifier is the owner's Social Security number. The sole proprietor doesn't need an employer ID number unless he or she hires employees. True, but not entirely. A Social Security card alone isn't enough to verify employee work eligibility. Verifying employee eligibility to work in the U.S. is a two-part process. The new hire can use a Social Security card to verify employment authorization, but he or she must also provide another document to establish identity. A Social Security card doesn't have a photo on it, so there's no way to verify identity with this card. Here's a list of the documents that are acceptable for establishing identity and employment authorization​. FALSE. All new hires must complete Form W-4 before receiving their first paycheck, and a Social Security Number must be specified on the form. The IRS says, "Do not accept an ITIN in place of an SSN for employee identification or for work. An ITIN is only available to resident and nonresident aliens who are not eligible for U.S. employment and need identification for other tax purposes. You can identify an ITIN because it is a 9-digit number, beginning with the number "9" and is formatted like an SSN (NNN-NN-NNN)." Not anymore. 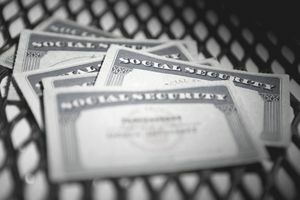 The Social Security Administration is initiating a new randomization process to "extend the longevity of the nine-digit SSN nationwide," so numbers issued after June 25, 2011, won't be tied to a specific state. The Social Security Administration allows you to verify Social Security numbers online. If you receive a Social Security card from a new employee and you aren't sure if it's real, or if the employee doesn't have a card or forgot the number, you can verify the number online. To use this service, you must enroll in the Social Security Business Online service. Then enter the number and get an immediate response. What is the Social Security Maximum Withholding?